Are you looking for present ideas for friends? Get a personalized full body caricature drawing, which will be designed by talented Photolamus artist, who will draw a digital caricature drawing, based on your personal photos and described requirements. 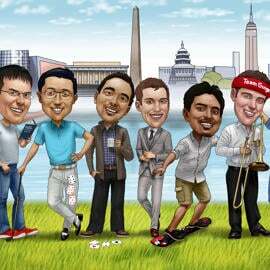 Caricature, which is featuring friends group can be drawn in any theme. For example, your friends can be drawn as superheroes, or we can draw them featuring their hobby or details from profession. Friends caricature drawing will be delivered as a printable JPG File on Email for your approval. Digital Caricature of group of friends can be also delivered as Printed Canvas, Photo Paper or printed on White Coffee Mug. Worldwide shipping is available.